Happy Friday!!!! It's been a long week and yes, it snowed and it is cold. Someday all this white stuff will melt and it will warm up. LOL!! Friday brings a new challenge at Pattie's Creations Design Challenge and this week the theme is to use RED in your creation. Remember the only real rule at Pattie's Creations is that you must use an image on your project....and of course, this time use red. Don't forget that that the only rule is to use an image...and while you don't have to use a Pattie's Creations image, we would love it if you do. OH - and guess what? At Pattie's Creations Design Challenge it's FREEBIE FRIDAY! Stop on over and get your freebie HERE! If you use one of Pattie's images you get an extra entry into the challenge!! Hope to see you over at Pattie's Creations! Thanks for stopping by! God bless you today and stay warm!!! Yummylicious card :) I love that cupcake! You've made a very yummy card. Thank you for joining in with our Touch of Red challenge at Cuttlebug Mania. Zella - I love reading your posts and the detail of what you used to make your creations! I thought that was a doily, and now I know it was a die, I might have one similar to that. I'm sure your granddaughter will love this Birthday card! What a wonderful birthday card. Your cupcake looks yummy. Very pretty Zella. I like the doily shape in behind the cupcake. The splash of white in the background really helps to make the image pop. I'm sure your granddaughter will love her card. 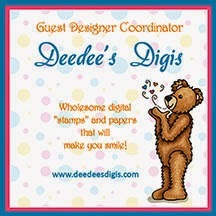 I also love the doily behind the cupcake image! Very fun and sweet! Looks good enough to eat!! Thanks for joining in with our Anything Goes challenge at Crafty Ribbons this time. Fabulously done card, cute image & great design! Good to see you join us for the Southern Girls Challenge, hope to see you come back soon! What a wonderful card! I love how you colored my "Cupcake With Hearts" image. Thank you for being on my Design Team. Thank you for joining our 2nd Birthday Celebrations / Anniversary Challenge over at Love to Create Challenges this week. Yummy cupcake on your sweet card!! Thanks for participating in Crafty Ribbons Challenges this week and welcome back for a new challenge on Thursday!